WALLIS -Wallis's Plan of the Cities of London and Westminster 1797. WALLIS, J. - Wallis's Plan of the Cities of London and Westminster 1797. Wallis's Plan of the Cities of London and Westminster 1797. - WALLIS, J. Title : Wallis's Plan of the Cities of London and Westminster 1797..
Map maker : WALLIS, J.. Size : 17.7 x 35.0 inches. / 45.0 x 89.0 cm. 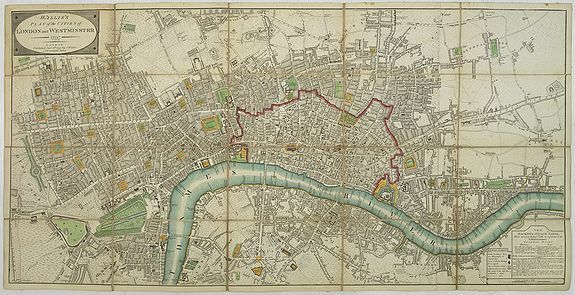 Description :First edition of this folding map covering Pentonville, Stepney, Lambeth and Hyde Park. Hand coloured sections laid down on linen. Title on oval at top left. Explanation of symbols, Hackney-Coach Fares and Scale at bottom right.